I knew, as soon as I heard that Becky Albertalli and Adam Silvera were writing a book together that I was going to read it. I had a feeling it would be a fluffy love story that I’d love every minute of because I love rom coms (and I’m less embarrassed about admitting it than I used to be). Yup. So I requested the library purchase the audiobook, which they did (obviously), and I was at the top of the holds list. It was good timing too; I was only reading with my ears last week as I wrapped up second revisions of my dissertation proposal. And it was exactly the right speed for me – I needed something light to contrast the heavy of my writing. If you haven’t already guess how I felt about this book, here’s my review. 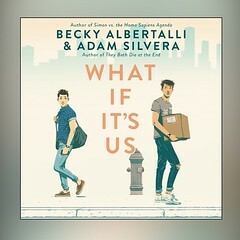 #SNRtbs What If It's Us by Becky Albertalli and Adam Silvera. I think this book came at the right time for me. Dealing with a number of heavy things, it was nice to listen to a romance with two adorable boys, a meet cute (I'm a sucker for all that), and a fun story. Albertalli and Silvera’s voices shone through — Silvera’s especially (I watch his Instagram stories). If you’re in the market for a light mlm romance novel that reminds you of the best of 90s rom com (but with boys), look no further.